Tac Tool Reviews - Is it a Scam or Legit? Inspired by the multi-tools used in the military, Tac Tool by Bell & Howell combines 16 useful tools into a single device that you can carry with you anywhere in the palm of your hand. Specifically, these include flat grip and pipe grip pliers, a hammer and nail remover, a multi-size wrench that adjust to between 6 mm and 10 mm bolts, along with must-haves like a regular knife, serrated knife, saw, large and small flathead screwdrivers, Phillips head screwdriver, bottle opener, wire cutter, and file. Multi-tools have been around for decades, since they were originally invented by Tim Leatherman in the 1980s. But does Tac Tool represent a new, innovative design, or should you keep looking and consider the competition? 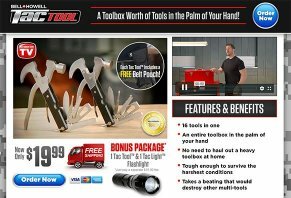 Does it actually represent a toolbox worth of tools in the palm of your hand? Here, we’ll provide the details you need to take a more informed next step, starting with price. How Much Does Tac Tool Cost? One Tac Tool will cost you $19.99, plus free shipping. During checkout, you can purchase a second Tac Tool and a bonus TacLight flashlight for an additional $10 fee. All orders come with a 90-day money back guarantee, less S&H, which you can request by reaching out to customer support at 844-771-2611. Tac Tool is manufactured by Bell + Howell, a brand that’s been around for decades and also makes other products in the lineup, including the original Tac Light, as well as Lantern, Lamp, Zoom, and Tape. Bell + Howell is owned by E. Mishan & Sons, based out of New York, NY. They held an A rating with the Better Business Bureau, based on more than 90 closed complaints, as of 3/15/18. Although a company representative responded in each instance, most seemed to reference lower quality than expected. How Can You Choose Between Tac Tool & Other Multitools? You probably already realize there are perhaps thousands of different multitool models and configurations available from hundreds of manufacturers, at just about every imaginable price point. At $20, Tac Tool is at the upper end of the price spectrum compared to much of the competition, but it also seems to come with the most tools. And while it also comes with free shipping, at least one model (Kikkerland) was available locally at Bed Bath and Beyond at the time of our research, which could not only save on S&H charges, but could also put it in your hands faster—assuming speed is important to you, of course. When it comes to purchasing a multitool, what should you focus on? The number of tools? Price? Something else altogether? Along these same lines, and specifically referencing one of Tac Tool’s main marketing claims, he points out that multitools are not intended to replace an entire toolbox. “Instead of trying to find a multitool capable of solving any repair need you can possibly imagine, focus on finding one that can deal with common, day-to-day problems and is small and slim enough to carry easily,” he recommends. Pulling all of this information together, where does it leave you when it comes to Bell + Howell’s Tac Tool? Based on what we learned from the Tac Tool website and commercial, as well as from the in-depth multitool buyer’s guide from Outside Magazine and Gizmodo, Tac Tool seems to offer a variety of tools that could come in handy in countless situations—especially if you don’t have your toolbox nearby. And while it might not necessarily be something that’s small enough to discreetly carry on your person on a daily basis, it does seem to feature a compact size that might work well as a backup, especially when stored inside a glove compartment or alongside your camping gear. Furthermore, it comes from a company with decades in business, who has a mostly positive online customer reputation, and who stands behind the multitool with a 90-day satisfaction guarantee. Just keep in mind that if you’re dissatisfied with its performance and decide to process a refund, you’ll have to pay to ship it back to the company, and you’ll also lose any fees associated with the BOGO/TacLight offer. Ordered two Tac Tools about two months ago and still have not received either one of them. Checking their order status page, I find it interesting that the order date on a their order status page advanced after the first thirty days passed without their shipping it. This has happened twice now. In my opinion, unless you enjoy having your money stolen, you need to avoid these scumbags like they have the plague. Write a Review for Tac Tool!